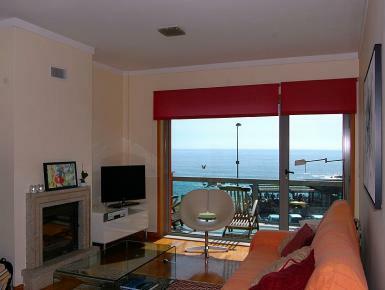 The building is on a prime location, right across from the ocean in Salgueiros Beach. This is a second floor apartment, with a garage for one car. In the entrance, there is a corridor, with a full body mirror. To the right we encounter the living room, with fireplace, sofa with relax system, two rotating chairs, TV and dining area with table and chairs. The balcony has a good area, chaise longue and excellent ocean view. To the left of the entryway there is a full bathroom, followed by an ample kitchen, with table and chairs. The kitchen is equipped with a refrigerator, dishwasher, microwave, toaster, and the usual general utensils. To the left of the kitchen there is a corridor, for access to the two bedrooms, both with built-in closets. One bedroom has a trundle bed, which can be used as one or two twin or one queen bed. The other room has a private bathroom, with a hydromassage bathtub, and a queen bed with a latex mattress.